Remember Capriccio*? Well they actually serve more than just paninis and salads… they also serve soups! As you can see, I ordered a bowl of soup. 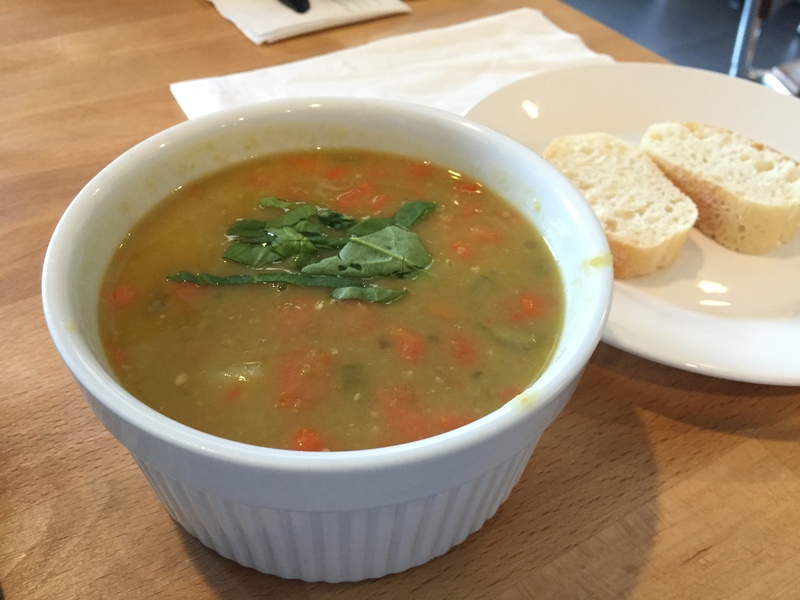 Split pea soup, that is. There wasn’t anything extraordinary about it. It was really just average. Okay, I guess. It even had an average price tag of $5. FYI, the restaurant serves complimentary bread too — it’s located by the complimentary water — which went well with my soup, though there was nothing extraordinary about the bread either. But who could say no to free?! Interested in a pretty solid panini or salad in Miami? Then check out Capriccio*! Today I ordered my default, the Capriccio panini. Essentially, it’s a grilled chicken sandwich with roasted red peppers, provolone cheese, and Pesto Genovese spread (i.e. classic basil pesto) on Ciabatta bread. The bread comes out pretty crispy on the outside, so it’s pretty good. The sandwich packs enough flavor and the chicken is also fairly moist! The sandwich also comes with some form of garlicky aioli on the side, which is pretty delicious too. I put a fair amount on, though had to resist eating all of it, so I wouldn’t scare away my co-workers back at the office with my garlic breath. Overall rating? Good. Can’t say that the portion size is anywhere near the larger end in Doral, but each meal is definitely enough food if you need to sit comfortably at a desk for a few hours straight after lunch. I dunno about you, but I’d prefer to avoid food comas at work.